Fettling the fleet – postponed – HubNut – celebrating the average! My wife, not content with scorchio weather in the UK, has headed to Spain, where it’s even hotter. “Ha!” thought I. “A chance to crack on with some car related chores!” I’ve been waiting for an ideal opportunity to give the 2CV a brake disc and pad change, but it always seems to find itself being used. It’s the only car that we’re both happy to drive. The poor 2CV also keeps finding itself dropped down the priority list – now the Mercedes has jumped the queue by wearing down one pair of pads to metal-scraping levels. Added to that is the fact that my quiet week on my own has been anything but. It’s been quite hectic, with a lot of bus driving, a fair chunk of work and a foraging trip to collect a load of firewood. This was a proper friend-of-a-friend tip – a chap who owned some woodland needed to get rid of some larch logs. They were not ideal for retail and were in the way, so he just wanted them gone. Free wood should never be declined and me and a friend have so far transported four loads to split between us. Initially, we used the Discovery and my trailer. This was an ideal opportunity to test its towing prowess. With a recommended maximum towing weight of 3.5 tons, a half-ton trailer should be no bother at all. Well, it wasn’t quite that straight-forward. For a start, I think we may have overloaded the trailer a bit as it was weaving a fair bit. Secondly, a steep hill climb in baking heat made it lose quite a lot of oil – through two unions which should have rubber o-rings but in fact don’t. With the front axle and front section of the chassis soaked in oil, a substitution was needed. So, my old Maverick got a run out! It had been offered by a friend to another friend as the second friend’s Mitsubishi Delica had become a bit broken. We didn’t load the trailer as heavily and the Maverick coped very well – I never really rated it as a tow vehicle, but it slogged away quite merrily. The next day, I decided to use the BX as a secondary hauling vehicle. This is less ideal because using a car as a van makes a bloody great mess of it, but an estate is meant to be a working car, so that’s that. Ok. The BX may be working its way back into my good books. It moved a goodly amount of wood with little bother – that hydropneumatic, self-levelling suspension really is rather good at this sort of thing. 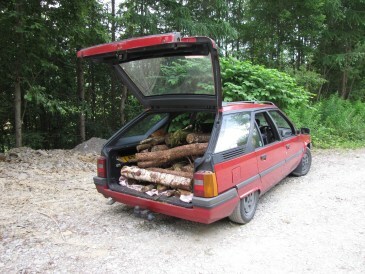 Maybe, now we’ve got a good stock of wood, I can reward the BX by getting some of its issues resolved. After all, there’s a reason that I’ve owned BXs almost continuously for getting on for four years – they’re really rather good.